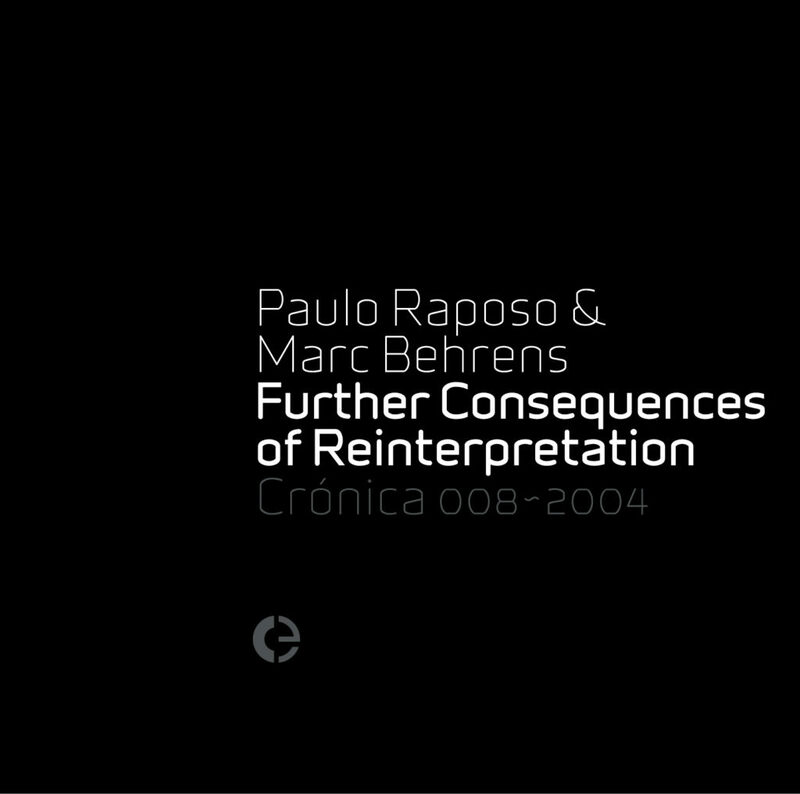 Hi, I’m back again with another new review, today it’s this 2004 album of Reinterpretations of remixes of music by *0 by Paulo Raposo & Marc Behrens, titled Further Consequences of Reinterpretation. Released by the label Crónica the CD is housed in a clear jewel case and also includes an 8 page booklet with 7 Reinterpretations of the album cover typography, some of them in a pretty fun DIY style kind of playfulness. As the title says, this album features remixes of remixes, or “Reinterpretations” as they’re called here of an experiment by Japanese artist Nosei Sakata (*0) who released a CD of sound outside of the human hearing range, a particularly interesting kind of sound art that I would definitely like to check out later. However, I’m starting my review at the end of the road of the remixing of that material, that happened. The Further Consequences of Reinterpretation, based on Reinterpretations of *0’s work by sound artists like Taylor Deupree, Richard Chartier and Bernhard Günter is a CD containing 21 untitled tracks, which are the finished pieces (as the back lists) created by Paulo Raposo & Marc Behrens by bouncing their sound material back and forth, that was premiered at a show at the auditorium of the Goethe-Institut Inter Nationes in Lisbon, carrying the same title. Now, unlike the albums I reviewe before, this obviously more of a flowing experience to listen to, rather than a traditionally compiled album. Many of the 21 tracks are short, but these all do form a rather nice sounding whole, a collection of music that falls both into the glitchy minimal side of Sound Art, as well as more atmospheric yet also mysterious Drone. Characteristic sounds on this CD are crackling “wooden” sounds, high pitched tones, often rising and falling in loudness in “waves”, stereo glitches, low rumbles as well as sometimes nicely “alien” sounding structures of glassy and metalic heavily manipulated sounds. The album feels like a mixture of longer developing percussive pieces with mid frequency drones as well as sometimes some low rumble and shorter more minimal percussive structures. Sometimes noise is also used in surprising bits, you’ll find out when you listen to this in full. I will mention a few of the longer tracks here and point out some things I particularly liked, let’s start with track 1. This track was originally released as >0 on the *0.000remix-Inflation album on the Mu-Label in Japan. It can be seen as a kind of base of the sound of this CD, it has all ingredients as well as an exciting dynamic between the wooden percussive sounds, glitches, tones and drones. There’s a nice progression in here too which goes from a minimal and percussive first half to a more drone based second half. It is definitely rather minimal music but never boring. Track 14 has some great quickly buzzing glitches and metallic industrial sounds, very nice clouds of impulses, a very cool aural experience and also probably a strange feel on the ears on headphones. Track 16 is also really fun as sounds get manipulated with often very quirky, almost psychedelic sounding filter effects, it’s like a really strange device being both high-tech as well as old-fashioned, steampunk in sound. Track 21 is a definite favourite track of mine, the closing piece very pleasantly flows as a drone infused with filtered bit-crushed sounding mid frequencies, sounding the most like Ambient of the whole CD, but an alien metallic kind of Ambient. Really nice music. I feel this CD has a great and interesting sonic texture to it, but I do have to point out my only little low point with it. Some sonic material does get reused on multiple tracks and I didn’t find it unpleasant really, however it does give the CD some repetition at some points, with the same sounds appearing in almost identical structures a couple of times. This is more of a personal thing though, because I also feel that the subtle variations between these similar pieces are interesting. Overall though, solid, enjoyable and fun CD definitely. This entry was posted in Reviews and tagged 008, Marc Behrens, Paulo Raposo. Bookmark the permalink. Comments are closed, but you can leave a trackback: Trackback URL.